Cooper turned 14 months old on March 22 and everyday is more fun than the last. I wanted to document a few Cooper-isms and new things he does at this age as I know it'll be just a fleeting moment soon. Playground: Most of the kids on the playground are much older - at least 2 so everyday he's been watching them learning what to do. Yesterday for the first time he 'got' how to climb up the stairs go down the slide and go back around to do it again. Such a toddler! Climbing: Even though he's been walking for months now we've somehow avoided climbing. Yesterday he started. We went to the playground and he just knew what to do (reference above video) then I found him IN his dresser drawer, climbing on top of the humidifier, using his shopping cart as a climbing tool and climbing on the couch. Oh, brother! Music: Music is in his blood on both sides of the family and we've made a point for him to listen to all kinds since we brought him home. He falls to sleep to lullabies every night. Every morning we turn up the radio and dance to whatever might be on. And at the first couple of notes to any tune he starts swaying to the music. I just enrolled him in music class that we start on Monday - we're very excited! Wheels: Like any little boy he's obsessed with wheels. Cars, bikes, strollers, wagons... anything that goes round and round! Here he is playing with a wheel on the playground. Kissing my ou-wees. I can show him a hurt and ask for kisses and he'll give them to me on my hurt. Hugs: He'll make the hug sound with me. Mmm-mm! Soccer: He loves kicking the ball around the house and kicking it back and forth with me and Owen. Here you can here him say "kick it." Cabin fever: Cooper loves going outside and so does mommy so we spent quite a bit of time outdoors. If we go too long indoors though Cooper will now bring me my shoes and fuss to take him somewhere. Holding hands: We just started holding hands and he's doing great with it. We'll hold hands walking to the playground or to the car and it's much easier than holding him or toting around the stroller. Highchair: He HATES the highchair almost as much as the car seat. If he had his way I'd feed him a bite and he could play while chewing, then he'd come back for more until he's full. He's a busy bee. It's kinda' exhausting at home ... and at restaurants. 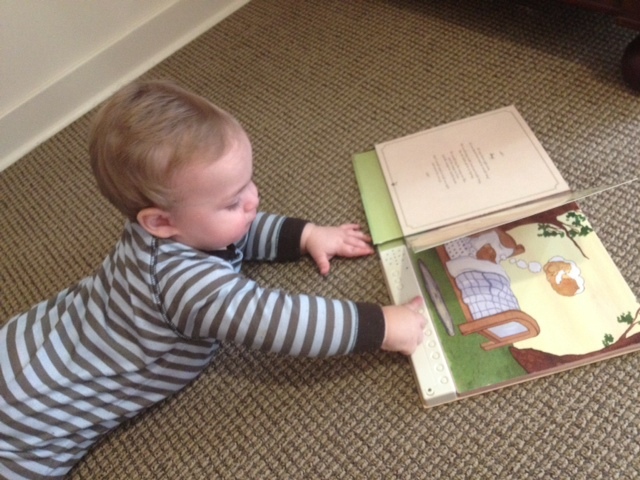 Reading: Cooper loves being read to and now "reading" to himself. Since he was born we've read a book to him every night and it's always part of the toybox we have out. I now find him all of the time in his room reading a book to himself. And sometimes he'll bring me a book which means he wants me to read it to him - no matter what I'm doing I never say no - so we sit wherever we are, he climbs in my lap and as soon as the story is over he's off again. Cups: He cries to drink out of mom and dad's cups rather than his sippy. He loves drinking out of a glass but doesn't quite get gauging how much liquid is there so if we let him do it he'll just throw it back and get the drink everywhere. You'd think if we'd let him do this a few times he'd learn - but nope, he thinks the adrenaline rush of cold water in the face is hilarious. Sock Monkey-In-The-Box: One of Cooper's awesome daycare teachers in OK, Penny, gave Cooper this little toy. Cooper loves being scared so this is a favorite although he was getting frustrated that he couldn't make it pop up. He quickly figured out the trigger mechanism and bypassed the music turning wheel but once he figured it out it was magic! Here he is back in March figuring it out for the very first time! Carrying things to and fro in his shopping cart and on his ATV. Yesterday he was transporting around my shoes, a couch pillow, and his drink on his ATV. He'll also fill up his shopping cart with toys and shoes, and whatever else from his room and move them to the living room and dump. Frustration: He gets really mad when he can't figure something out or if something is in his way. It's so cute now but I'm sure one day it won't be so adorable. Chalkboard: He loves his chalkboard wall. He favorite part is giving me the chalk and having me draw something and then he colors over it all the while talking up a storm. Small spaces: He loves small corners and spaces. I'll often find him reading or playing in the back corner of his closet, a certain inconspicuous corner in the living room or in the bottom of the pantry. 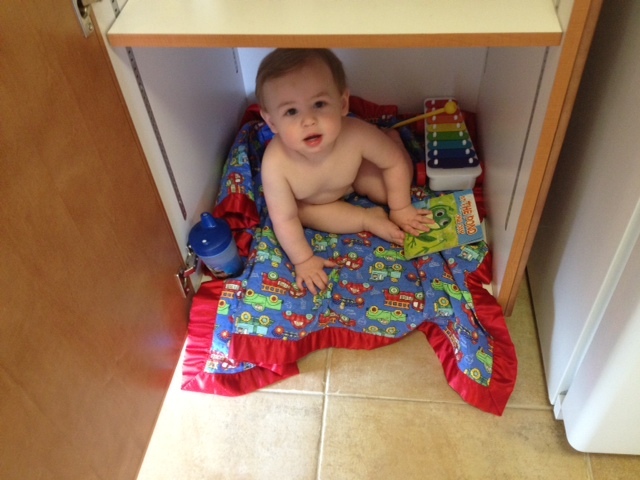 He loves the bottom of the pantry so much that we decorated it with glow in the dark stars. Here he is with his blanket, drink, a toy and a book - all a little boy needs! Pointing: He points at everything and says "that." It's super adorable now but when he can really talk I bet it might just start getting old. Flip-flops and toes: Now that Spring is here the moms all have their flip-flops on and pedis done. Cooper will spot sparkly shoes or painted toes across the playground and make a b-line to get a better look! Flirt: Okay, I know everyone says there little guy is a flirt but seriously he gives this shy look that is irresistible. He will stare at a lady or another toddler until they make eye contact, then he'll smile and give that shy look again and then look away. It's so ridiculously cute. Love that precious baby boy! Oh, I have soooo many comments, but I will try to be brief. I am floored by the slide video! Watching Cooper maneuver the "big" slide makes me feel like a an overprotective mother worrying about the indoor kiddie slide at daycare. He is just thriving - so smart, handsome, coordinated and a little BOY, not baby. And I think my favorite thing both boys do (and the older kids in daycare used to do when C & M were in the baby room) is the back-into-your-lap-move to have you read them a book. It melts my heart every time. We miss you! Good grief his concentration with the Monkey in a Box is amazing! Thanks so much for sharing!!!!! Sarah - Thanks for the sweet comments. It's funny - every once in a while he makes a face or does something that is so Milo. Very cool to know they influenced and shaped eachother's first year... and beyond! Thank you Julie - he is a very analytical little boy and determined, to a fault, to figure things out, no matter how long it takes. I love catching moments like these on video!